A great afternoon on the lake. Originally uploaded by Big Dadoo. We took the boat out for a cruise on the lake this afternoon. It’s a great day, very calm and hot which made for great boating. We headed south west and planned on looping by Queen Island and up thru Crow Rock Pass and back home. But, the GPSr showed a geocache in the neighborhood so we made a little side trip. It was just 28km round trip off our planned route, but it was such a nice day we headed off further south. 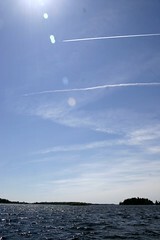 Well there is noting like 4 hours on the open water under a hot sun to for on your tan or fry you to a crisp. One of us survived, but Shirley is looking a bit like a lobster tonight! See that little spec at the head of the white line? It’s a plane. And more that likely it’s heading to Toronto. Poor them. This picture is from my boat on beautiful Lake of the Woods. It’s sunny 25-27, breezy and a great day. Several times on business trips to and from Toronto I’ve been able to look out the window and spot the point of land where our cottage is located from about 30,000 on a clear day. You see, right over Lake of the Woods is where the Air Canada Toronto to Winnipeg flight starts it’s descent into Winnipeg. When I’m at the lake and look up and see the contrails of jets going east and west overhead I can’t help but think of the people in that amazing flying machine going to and from the big TO. Hopefully, they are traveling for happy and good reasons and not just another business gig. I’m so much happier looking up from the dock and viewing the plane that when I’m on the plane looking down on the dock. Today, we were heading into Kenora (see the pictures) to return some movies and I couldn’t help but think of the people on the plane. Friend’s are moving back to Toronto, but they are driving, and that’s another story. 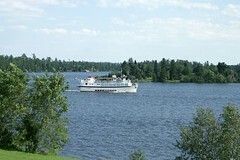 We were driving by Safety Bay on the way into Kenora from Keewatin when I spotted the MS Kenora. The scene just seemed to be set for a nice shot, so I pulled over to the side of the road to capture this picture. Today we were in to church in the morning and did a little shopping as well as stopping at HoJo’s a new coffee shop in downtown Kenora with free wireless internet access, a plus for me! This may become a regular stop on our trips to town. The weather has been quite rainy, and despite the picture most days have been cloudy with rain. Today it has flipped several times from cloudy to clear and back again. 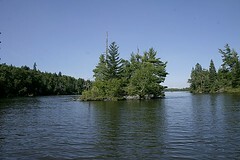 Tomorrow, if it’s raining, we’re taking a road trip to Dryden to do a little geocaching for a day out of the cottage. It’s Canada Day and Day 4 of our vacation. Scott & Mandi joined us at the lake arriving late last night. We sent the day just enjoying the first full day of sunshine by loafing on the dock and soaking up the rays. 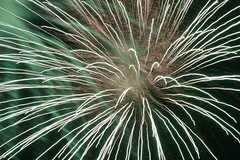 After dinner we all headed into Kenora to watch the fireworks. This year they launched them from Conney Island which made them seem quite far away. I guess we’re all getting a little jaded because nobody seemed to think that they were as good as previous years, but still a fun time and a fitting end to a very nice day. We live in such a great country and unfortunately we all tend to take it some what forgranted. We have so much to be thankful for. Today was out first full day of vacation at our family cottage on Lake of the Woods. Day 1 was spent packing up and then spending a wonderful afternoon with friends who are moving back to Toronto. We wish that things had turned out differently and that we would have spend much more time together here in Winnipeg, but I have a feeling our friendship will survive the distance and we’ll still connect from time to time. As you may have guessed from the photo, it wasn’t exactly a ripping hot day. The sky is overcast and the morning is spent with the usual cup of coffee and a great book which I’ve almost finished. After reading a couple of chapters, Shirley is up and we have breakfast. The tree that blew over last week is calling me, so I sharpen the chainsaw and get to work. The clearing that the loss of this tree made is just begging to be filled so we take a walk down the road in search of a replacement. I know this time of year is not the greatest for transplanting small trees, but in the ditch along our road there are many spruce trees. Their life and height is severely limited because at least twice a year the road crew comes along with a brushing machine that clearcuts an 8′ swath alongside the road. I figure the small trees will stand a better change being uprooted and replanted along side our driveway as opposed to having their heads cut of year after year. It starts to rain mid-afternoon which means a book and a nap are in order. 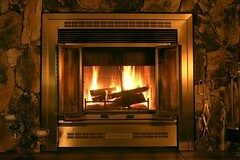 It’s amazing how doing nothing on a rainy day can make you so tired. Perhaps it’s the need to catch up on our sleep that is taking over. After a short nap and while Shirley is still catching some Z’s, I get the computer out and post a few photos and even check the work email (what am I doing?). The connection at the lake is dial-up and I’m wishing that I’d arranged for the high(er) speed wireless hookup that is available in our area now. It’s hard to go back to this slow of a connection. It’s probably for the best as the lake should be all about un-plugging not staying connected, but we’ll see. 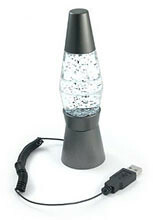 It wasn’t that long ago that Lava Lamps were ridiculed and now they seem to have become somewhat “cool” now but this is going a little too far. Last weekend was the first nice weekend at the lake this summer. We spent the day on the dock soaking up the sun and enjoying the ripping south wind that was bringing in the heat. After dinner, the wind died down so we headed out on a little cruise in the boat to watch the sun go down. A great end to a great day. Well, literally I’m back up and running with a new disk and most of my software and data recovered. There are still several key files that I’m trying to recover via software, but that’s not going too well and as time passes, hope dims. Thanks to having a second disk on hand which I could sacrifice I was actually functional last weekend. The real replacement didn’t arrive until Monday afternoon, and I’ve spent may hours locating, downloading, re-configuring and remembering passwords etc. Yeah, one of the files I lost was an encrypted database that had all my userids and passwords for almost everything on my computer, web sites etc. On one of my very first job interviews over 30+ years ago the interviewer asked “What’s the most important thing in IT?”. Well, I made up some answer that I thought was pretty good, but it didn’t line up with his. His answer was simple, “Backup”. I’m beginning to think he was right. This is what greets me on the screen of my IBM T40 Thinkpad this morning at 8am. Initially, I’m not to worried, but after a couple of re-boot attempts, it begins to sink in – I’ve lost my disk. This is the kind of thing that happens to other people, not me. The T40 has been rock solid for over 3 years, and now this. The very interesting thing was I’d been paying more attention to backing up my hard drive in the last week or so. I’d noticed a new “Rescue & Recovery” software utility on the IBM internal site and being a sucker for new software, I decided to upgrade to this tool. While installing this software, the previous version gets uninstalled and the hidden recovery partition also gets removed. The good side is that I now have 15gb more space, the soon to be bad news is I don’t have a recovery image. After the new software is installed I give it a try and create a bootable recovery CD (good news), but the backup of my 50+gb of data won’t fit anywhere so I don’t take a backup (bad news). Also, the interface to the backup is pathetic and makes it very difficult to do a selective backup. But, I’m still thinking that a backup is important so on Wednesday of this week I run the Tivoli Storage Manager tool that is standard on the IBM image and backup lots of stuff to who knows where out on the network (good news), and hopefully, the restore of the data will also turn out to be good news. So, here we go 1-800-IBM-HELP to the rescue! I call and select the hardware option and get a very friendly and helpful young lady who informs me that there is just one disk like the one I need and it’s in London, Ontario. (Hey, I was just there last week on business) and that hopefully it will be shipped to Winnipeg and arrive by Monday, or Tuesday. I’d hoped for local availability and to get some of this out of the way today, but what can you do? The disk will be totally blank and I’m requested to call back and request software support to get the new disk imaged with all the standard IBM stuff when it arrives. Well, several more phone calls later I’ve logged a software call and the local deskside support person will call me back. Up to this point I’ve been working from home, so I head into the office because I know deskside support doesn’t make house calls. Once in the office I learn that Ray now only works on-site half time and won’t be in until after lunch. I’m so dependent on being online and having that Thinkpad work all the time and everywhere, and now there is not much to do except wait. While I’m waiting I take the opportunity to clean my desk and do some long overdue filing. Ray calls! Yahoo, we can get this process under way. I’ve decided to sacrifice a second hard drive (which is not backed up at all, but generally the stuff is recreatable, probably after several days of downloading and messing around) that I have to the re-imaging process so that I can begin to get on with my life. Ray’s not too hopeful about recovering anything from the damaged drive and says he’ll have the reimage done by the end of the day. Back to my desk and I finish the clean up. I’ve started making a list of what I’ll have to install and also a list of things I should backup more regularly and stuff I should print out once in a while. All my contacts are in Lotus Notes & Outlook. That network backup better be good. More later… it’s 2:30 and there is a lot of work ahead. When I was younger, perhaps six or seven, my family lived in Toronto. 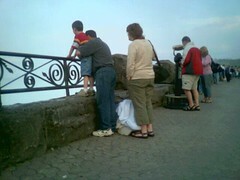 and, like this family, my parents took my sister and I to Niagra Falls. One of my most vivid memories of this trip was the hight of the stone wall shown in this picture. I remember it being so very high and that my dad, had to lift me up to look over the edge and down into the gorge, Just like the young lad in this photo. I was both thrilled and scared at how far down it was from the edge of that wall to the bottom of the gorge. Well, many years later, on a business trip to Toronto, I again went to Niagra Falls and was stunned at how low this wall actually is. It’s only about two feet high! It’s all a mater of perspective, but it’s still a long way down.